A couple who has been on law enforcement radar for most of 2018 is now blamed for a burglary in Windham Township, Wyoming County. 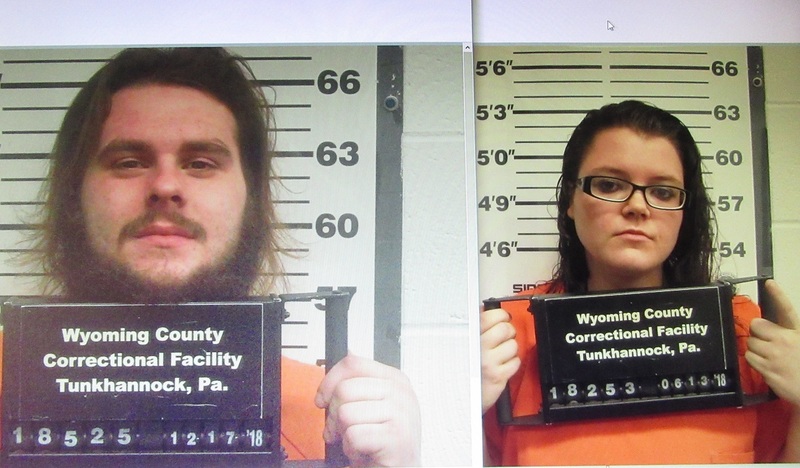 According to Pennsylvania State Police, Austin Keith Hoskins, 23, and Kyle-Ann Lucas Tunis, 26 conspired to steal a safe containing $60,000 in cash, as well as a box of jewelry from a man on Hamlet Lane who had just recently put up bail to get Hoskins out of prison. The couple subsequently purchased vehicles for themselves with the cash. Tunis was arrested in February 2018 for unlawful taking and receiving stolen property in Washington Township. In June, she was charged by Dallas Township police for stealing and wrecking a work van. An investigation revealed that it was more likely that Hoskins had stolen the van, crashed it on Demunds Road in Luzerne County and fled the scene, leaving Tunis in the vehicle. He was just recently charged for the incident. Hoskins told police that he ran because he had been huffing “duster.” Both admitted to knowing that the van was stolen, but both denied driving the vehicle and hitting a guide rail, a mail box and rear-ending another vehicle three times. The burglary occurred on the morning of Dec. 11 after Hoskins and Tunis had visited with the victim briefly. They then drove to the Dandy Mini Mart in Mehoopany, where they parked for about 45 minutes and waited for the homeowner to leave his property. Surveillance from the mini mart confirmed the time span that Hoskins and Tunis sat in the parking lot before traveling back north on SR4002 toward the victims residence. Tunis was interviewed on Dec. 17 and admitted to state police her involvement in the burglary and hiding her car in Tunkhannock Township. According to the affidavit of probable cause, the couple bought a 2012 Kia Soul for $5,200 in Clarks Summit and a Subaru WRX in Tannersville. The Subaru was discovered abandoned near Pond and Morrison roads in Windham Township on Dec. 16 with the windows smashed out, what appeared to be blood on the gear shift, and the license plate removed. Tunis told police that Hoskins was staying with another friend in Windham Township. Law enforcement officials already had an active warrant for his arrest for an unrelated case, so vice officers visited the home to find Hoskins hiding in a bedroom. In the garage at the residence, they found several bags of clothing, vaping devices and accessories, expensive bottles of liquor, new parts of a car and an open black safe. The license plate to the Subaru was found under a mattress in the garage. Hoskins was wearing a necklace dry box containing more than $4,000 in cash and several glassine baggies in his wallet were suspected to contain heroin. Hoskins was charged for burglary, conspiracy to commit burglary, criminal trespass, theft by unlawful taking and receiving stolen property. His preliminary hearing was set for Jan. 3. Charges against Tunis for the most recent incident have not yet been released.